In the field of casting using the conception of conventional post-process quality control the amount of wasted casting products can increase caused by long time delays between casting defect origination and defect detection. On the one hand a process integrated detection and characterization of casting defects enables to select waste immediately. On the other hand occuring process changings which influence the casting quality, can be controlled. Both advantages decrease the amount of waste and finally production costs. This paper presents a developed conception for process integrated detection and characterization of ligth metal casting defects. A process integrated microfocus-radioscopy system is used to describe quantitatively the origination, size, type and growing velocity of casting defects in 2 dimensions. By this, synchronously recorded acoustic emission signals can be analysed. 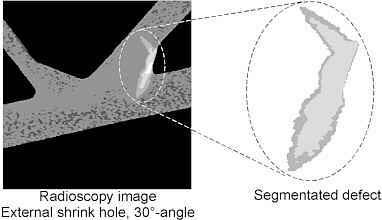 Aditional to the results of the radioscopy system the Institute of Nuclear Engineering (COPPE) made investigations in cooperation with IKPH using a tomography system to get information about the third dimension which meens about the depht and position of the defects inside the casting. The aim of this conception is to use all informations about casting defects given by radioscopy and tomography to develop and calibrate a acoustic emission system which enables to detect and characterize casting defects. Due to this the combination of this methods will enable to make acoustic emission suitable for industrial applications. The conventional way to inspect the quality of light metal casting parts is based on a post-process quality control. Using this conception the long time delays between casting defect origination and defect detection can cause a high amount of wasted casting products (Fig.1). The con- ception of process-integrated quality control gives possi-bilities to detect and cha-racterize casting defects on-line and due to this to select waste immediately. Additional occuring process changings which influence the product quality, can be controlled. Both advances decrease the amount of waste and finally the production costs. To realize a process-inte-grated quality control the conception shown in figure 2 was followed. The ca-sting process which is influenced by process pa-rameters like thermal eco-nomy, alloy composition or black wash will be pursued with particulary to the problematic nature adjus-ted sensoring systems. On basic factors orientated sensoring systems like microfocus-radioscopy, and tomography will be employed and corelated with sensoring systems which can be applicated under industrial conditions. Those, on industrial applications orientated systems, are acoustic emission and the temperature analysis of the casting. Realizing this conception (Fig. 2) will enable to develop a process parameter control and consequently to stabilize the casting process. According to the testing problems referring the analysis of casting- soli-dification- and cooling-processes in the field of light metal casting a test bench were build shown in figure 3. The test equipment enables to record and analyse dynamic events in de-pendence of relevant process parameters. /1/. Using microfocus-radio-scopy gives the possi-bility to determine continously the density of the casting parts. The density depends on the casting temperature, the state of aggregation of the alloy and the occurrence of casting defects. The system enables to persue, record and analyse solidification stages, defect origination and defect development inside the casting parts. The model child mold used during this inves-tigations (Fig. 4) enables to simulate problems like they occure in the field of light metal casting of rims in the automotive indus-try. The casted test part consists of four spokes which are arranged in angles of 30°, 60° and 90° to each other. The strong material accumu-lation in the center area of the casted test part and the crass change of cross sections make a casting free of defects more difficult. The test child mold have the dimensions of 300mm width, 160mm height and gives the possibility due to integrated resistance wires and thermoelements to adjust exactly and control the child mold temperatures. To record the acoustic emission signals which are originated from growing casting defects external accoustic emission sensors are placed on the child mold. Although the presented results prove the efficiency of radioscopy, this system have certain characteristics which justify to develop and employ further process integrated testing systems. One of this characteristics is that the integration of radioscopy in industrial applications is doubtful because of reasons of radiation protection. This means, that the results from radioscopy should rather be used to fit other systems (acoustic emission analysis or temperature analysis) for industrial applications. A simple, on industrial applications orientated system represents the temperature analysis of critical child mold areas. Those critical areas (hot spots) are controled by thermoelements which are integrated inside the child mold (Fig. 4). Monitoring the changings of the temperature gradients over the time enables to detect casting defects which are situated near the surface around the hot spots. Because of volume deficits like internal shrinkages or hot tears (Fig. 5) the heat flow from the casting part to the child mold near the surface will be disturbed and the determined temperature gradient will take high negative values (Fig. 5). More difficult it is to analyse and value the acoustic emission sig-nals which are origina-ted from the casting part and the child mold during the casting pro-cess (Fig. 6 below). Only a analysing method which takes both systems (radio-scopy and acoustic emission) into consi-deration will give the possibility to correlate extracted quality cha-racteristics like the ca-sting part density with characteristic values from acoustic emission. For the objective and quantitative description of dynamic events of the casting part during the filling-, solidification- and cooling phases a automatic detection of casting defects is necessary and was realized in four partial steps (Fig. 7 left). Because of reasons of radiation protection the filling of the test child mold which is placed between the microfocus X-ray tube and the image identifyer was realized with a remote controled casting system. In the first partial step the image values generated by the image identifyer were recorded with a conventional CCD-video and sent to the image processing system for digitizing, integration and storage. The aim of defect seg-mentation is to delimit the detected defect as precise as possible from the background which surrounds the defect (Fig. 8). The extracted characteristics of a de-tected casting defect depend considerable on the threshold value which is used during the defect segmentation. Therefore a automatic method, which means a objective and reprodu-cible process, is necessary to determine the threshold value. The results of this investigations show that the threshold value can be determined reproducible in the point of intersection of two normal distributed frequency approximations. The extraction of charac-teristics contains the de-termination of properties and characteristics which describe the casting de-fect. Within this investi-gations three different groups of characteristics were determined which include informations about the geometry, the distribution of gray values, and the contour of the defects (Fig. 9). To apply the ex-traction of characteristics not on single images but on series images will give the possibility to repre-sent and analyse the cha-racteristics in depen-dance on time. As it is shown on one geometric characteristic, the casting defect area (Fig. 10), growth processes of dif-ferent casting defects can be analysed specific-ly. The curves in figure 10 show clearly for each type of defect characte-ristic courses. Aditional to the in-vestigations with the radio-scopy system the Institute of Nuclear Engineering (COPPE) made investigations in cooperation with IKPH using a tomography system. The radioscopy gives only information in two-dimensional form which means that it is impossible to get informations about the defect extension into the third dimension. Therefore investigations using tomography were made. Some results of the tomography images are shown in figure 11. The characteristic values given by analysing the tomography results were the defect volume and the placement coordinates of the defect inside the casting part. To analyse and evaluate the acoustic emission signals send out from the casting part and the child mold, which means to determine informative characteristic values a conception was realized which contains as well four partial steps (Fig. 7). The recording of the acoustic emission values is realized with a conventional PC with a 120MHz Pentium processor, 64Mbyte RAM and a integrated eight channel analog/digital converter card. One-channel measurings permit a maximum sample rate of 700kHz which is equal to a recording time about 46s. For low frequency investigations up to 50MHz analysing frequency, conventional piezoelectric acceleration trancducers were used. Due to the high amount of data, which means a maximum data memory of 128Mbyte per measuring in case of basic investigations, the first step of the data pre-processing was to extract the data sections concerning the origination of casting defects. The informations which are necessary to realize the extraction are contained in the synchronously recorded and already processed radioscopy image values. To eliminate occuring high- respectively low-frequence disturbances the extracted signal sections which are relevant for further analysis will be digital high- respectively lowpass filtered (for example low-frequence disturbances are caused by dispersion effects of the power supply, high frequence disturbances are caused by noise pulses from the thyristor control). In the third partial step, a special analysing software was employed to determine characteristic values from the extracted signal sequences. Due to this characteristic values which describe the form respectively the behaviour of the extracted signal sequences can be calculated in time- and frequency-domaine. For example changings of signal intensities can be described by statistical time based characteristic values as the variance or standard deviation. The curtosis factor characterizes the peak containment inside the signal course. In the frequency domain the autospectral power density describes each component of the time signal in frequence and amplitude. Due to this compression of information at the same time a reduction of data can be realized about factors in the range of 103 up to 104. The calculation of characteristic values causes a high amount of values which contain redudant informations. Due to this the forth partial step will be to reduce this amount of values using extraction methods. This can be realized with statistical methods like cross correlation analysis. The last part, following the method to analyse radioscopy- and acoustic emission values, will be to correlate the characteristic values of the radioscopic detection of casting defects with extracted characteristic values of the acoustic emission analysis. The correlation between the time based characteristic values of acoustic emission analysis and the defect characterizing radioscopy values did not come to very satisfactory results referring the low-frequency measurements. The reason can be found in the fact that different acoustic emission signals initiated from different events were superimposed. Events like the origination of casting defects can occure at the same time with events like e.g. thermal caused relative motions between the casting part and the child mold. 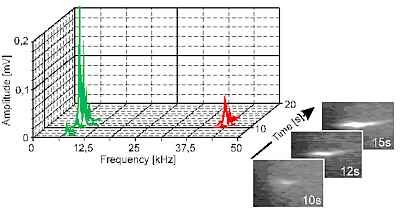 For the distinction of these superimposed acoustic emission sig-nals it is advantageous to make a time dis-integrated investigation of the signals analysing them in the frequency domain. Reference in-vestigations on defect free casting parts showed that the time based amplitude spec-tras of the acoustic emission signal consists only of low-frequency parts (Fig. 12). The reasons for those low-frequent emission events are flow processes du-ring the child mold filling or friction processes bet-ween the casting part and the child mold. where, using radiosco-py, hot tears could be detected show that the time based amplitude spectras contains beside the known low-frecuency parts also higher frequency parts (Fig. 13). That means, the results from radioscopy could be correlated exactly with the results from acoustic emission analysis. The investigations described in this paper show, that in the field of light metal casting following the conception of a process integrated quality control the employment of basic orientated methods like microfocus radioscopy and tomography can be used to make temperature analysis systems or acoustic emission systems usable for the industry. The higher ordered aim in this case is to realize a process stabilization by regulation of process parameters using the developed sensoring systems. The results show, that the employed methods are suited on one hand for the analysis of the child mold casting process and on the other hand for a process integrated detection of casting defects. The authors thank the german research community (DFG) for the support of the presented investigations which were realized inside the Special Research Area 326, named ,Process Integrated Quality Control with Quality Information System for Metallic Parts in Mechanical Engineering", and special thanks to the scientific bilateral project between Brazil and Germany supported by the CNPq, KFA and DLR to realize the presented investigations in advanced radioscopy and tomography.